Who Should Consider Schools with Open Admissions Policies? Are Open Admissions Schools Inferior to Traditional Four-Year Colleges and Universities? Below, we have ranked the best colleges with open admissions. This guide illustrates the benefits of an open admissions program and the advantages of pursuing higher education. Open admissions imply a school's enrollment is not competitive. This means that all qualifying students (students with a high school degree or GED) are welcome to apply and enter the program without additional qualifications or performance benchmarks. For students with below-average academic records or limited resources, open admissions bypass competition and instead prioritize a student's personal commitment to education. Rather than requiring the submission of standardized test scores like the SAT or ACT, many open admissions programs use placement tests to gauge student capabilities. Most open admissions programs are at two-year institutions, such as technical schools and community colleges, though a select number of four-year institutions also utilize the open admissions format. 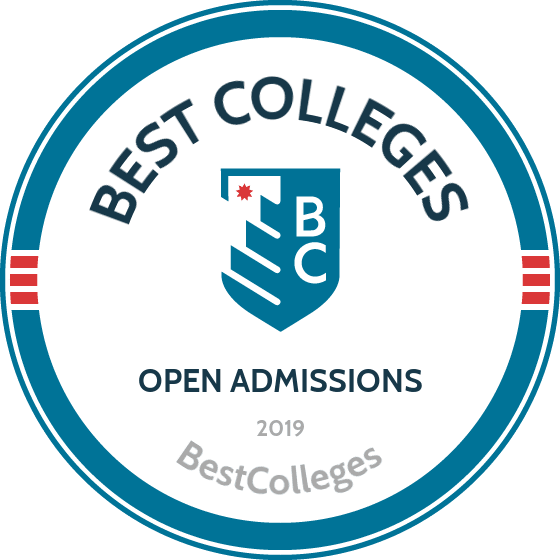 The following ranking of the best open admission colleges details some of the benefits of individual programs. What Are The Advantages of Open Admissions? Schools that have open admissions do not have as strict of acceptance requirements as many other schools. Most students only need to have a high school diploma to be admitted. The benefit to this is that all students have the same opportunity to obtain a higher education. This can also lead to less discrimination based on an applicants race or class. The United States Merchant Marine Academy is one of five federal service academies in the U.S. Students at the academy are known as midshipmen and take part in courses focused on teaching graduates to run large sailing vessels. All degrees require a higher number of credit hours than a typical baccalaureate degree; in addition to their bachelor's, graduates also receive a U.S. Coast Guard license and an officer’s commission in the U.S. Armed Forces. U.S. News & World Report ranks the school as the third best Regional College in the North. Students pay the same tuition and fees of $1,032 regardless of state of residence. USMMA has six academic departments, including marine engineering, humanities, marine transportation, mathematics and science, naval science and physical education. Wabash College is a private liberal arts college serving an exclusively male population. U.S. News & World Report consistently ranks the school as one of the best National Liberal Arts Colleges in the nation. The school’s curriculum is divided into three areas, known as Divisions I, II and III, which represent natural sciences, humanities and arts and social sciences. Over 40% of the student body is a member of a sports team, and over 80% take part in some form of intramural sports. Greek life is also wildly popular on campus. Around 25-30% of graduates enter postgraduate programs, including 8-10% in medical and law schools. Of those students moving straight into the workforce, 31% start careers in business, while 9% work in government, social service or teaching. 90% of students receive some type of student aid. The student body is currently composed of 902 students from 32 states and 12 international countries. The student to faculty ratio is 11:1. As of 2013, 98% of faculty hold a PhD or terminal degree in their field. Offering degrees at the bachelor’s, master’s and doctoral levels, Northwest Polytechnic University is focused on providing students with education in the areas of science, technology and management. The school is nestled amongst many high-powered technical organizations in the area, providing excellent internship opportunities for students aspiring to work in Silicon Valley. Students also take part in many different student association and career center programs to make them competitive upon graduation. NPU attracts students from across the world and has a significant international population. The university is in a prime location, offering easy access to San Jose, San Francisco, Berkeley and Palo Alto. NPU is one of the newer polytechnic universities, founded in 1984. A liberal arts institution, Humphreys College has two campuses located in Modesto and Stockton, providing educational opportunities at the associate, bachelor’s and master’s levels. The college offers eight undergraduate and three master’s degrees, with further specializations available within each. Over 80% of the student body is comprised of baccalaureate students, with plans to increase postgraduate offerings in the coming years. Of the graduating student body, 89% report they would choose the school again if starting their academic careers. Students are very impressed with the academic rigor of the college, with 92% reporting that the school places "substantial emphasis" on academics. Boricua College has served a largely Puerto Rican and Hispanic student body since first opening its doors in 1974. With a mostly bilingual faculty, 90% of its 1,200 students identify as Latino. Operating from four campuses in the city, the college offers programs at the associate, bachelor’s and master’s levels. The university is considered nontraditional thanks to its competency based type of education and because the majority of students are considered adult (over 25 years old). The current graduation rate for associate and bachelor’s programs is 69%. Notable academic programs include studies in human services, Latin American and Caribbean Studies and Inter-American studies. Many students are working while attending Boricua; most complete their degrees on a part-time basis. Wayne State College is a four-year public institution, offering over 90 areas of study to its student body of 4,000 students. Degrees are offered from the schools of arts and humanities; business and technology; education and counseling; and natural and social sciences. The most popular degrees include criminal justice, industrial technology and special education. Students from 35 states and 19 countries enjoy a student to faculty ratio of 19:1. Over 60% of incoming freshmen come from the top 50% of their high schools. U.S. News & World Report ranked Wayne State College as one of the Best Colleges in the Midwest Region for 2015. 80% of students graduating in 2013 chose to stay in the state for graduate school or employment. This four-year public college is home to over 3,000 students undertaking studies in more than 50 degree areas at the bachelor’s level. In addition to a full selection of academic programs, Chadron State also has more than 70 clubs and organizations and a robust set of athletic teams. The college has an extensive online learning portfolio, with many different courses and majors offered wholly online. Despite being a public university, classes are kept small: the student to faculty ratio is 19:1, while the average class size is 17. U.S. News & World Report identified Chadron State as one of the Best Regional Colleges in the Midwest region for 2015. 70% of the faculty hold a PhD or terminal degree in their field of expertise. In the inaugural survey of business schools by Military Times Edge magazine, CSC was ranked 17th nationally for their commitment to serving the veteran and military communities. This private Roman Catholic liberal arts college serves 1,135 students hailing from 38 states and 13 countries. Briar Cliff boasts over 30 bachelor’s degrees, two associate programs and three master’s degrees. In 2014, 100% of first-time, full-time students received financial aid, with the average award package totaling $23,000 annually. Given the rural location, over 46% of students elect to live in on-campus housing. BCU provides an individualized education for all students, with the student to faculty ratio holding steady at 12:1. Students can participate in more than 30 student clubs, organizations and intramural sport teams. U.S. News & World Report ranked BCU as the 38th Best Regional College in the Midwest for 2015. Southern Nazarene University is an open admissions institution that provides over 2,200 undergraduate and graduate students with a Christian education. While the university is primarily focused on baccalaureate studies, there are three graduate and seven professional programs available. The university requires that all students under the age of 22 live on campus, providing a rich communal environment with many different opportunities to engage in student clubs, organizations and intramural sport teams. U.S. News & World Report ranked SNU as one of the Best Regional Universities in the West for 2015. Tuition and fees for the 2014-15 academic year totaled $22,680. The student to faculty ratio is 17:1, with over 70% of classes having fewer than 20 students. Operating as a public funded university, Weber State offers a variety of technical certificates in addition to programs at the associate, bachelor’s and master’s levels. Aside from traditional campus offerings, the institution also has a robust selection of online, hybrid, distance learning and independent study options to meet the varied needs of its student body. Personal attention is a hallmark of a WSU education, leading more than 26,000 students to call the university home. WSU offers over 250 undergraduate programs and 11 graduate programs. During the 2013-14 academic year, the university awarded over $95 million in financial aid. U.S. News & World Report ranked the school as the 68th Best Regional University in the West for 2015. Martin Methodist College is a private liberal arts college providing over 30 baccalaureate degree options to its student body of 1,200. Though small in size, the institution is consistently recognized for its intercollegiate sports programs and the athletes who attend. As of the 2014-15 academic year, this open admissions university cost $23,100 in tuition and fees per year. Popular programs of study include biology, business administration, Christian education, nursing and English. The campus is in a rural setting, with Nashville, TN located 70 miles to the north and Huntsville, AL 40 miles to the south. In 2015, it was named one of the fastest growing institutions in Tennessee. National University is the 12th largest private nonprofit institution of higher education in America, and the largest in the state of California. Serving over 26,000 students, the university is divided into five professional schools and one college offering degrees ranging from associate to doctoral level studies. These include: the college of letters and sciences; the business and management schools; education; engineering and computing; health and human services; and professional studies. National University is a leader in online education, offering more than 70 wholly online undergraduate and graduate degrees and 1,200 courses. NU offers reduced tuition for members of the military and their dependents and has numerous learning centers located on U.S. military bases. In addition to its main campus, the school has 28 other academic campuses throughout California and Nevada. Granite State College operates as one of four institutions comprising the University System of New Hampshire, the state’s public university system. The university is focused on providing adult education via associate, bachelor’s and master’s level degrees. In addition to traditional campus based courses, the university offers an extensive online learning program and many evening and weekend classes to meet the needs of working students. There are also eleven locations throughout the state. Washington Monthly ranked GSC as one of the Best Liberal Arts Colleges in 2013, including a Top 5 ranking for Social Mobility. U.S. News & World Report ranked the college 48th for Best Online Degree Programs in the bachelor’s degree segment. 19% of students are full-time; the average student age for undergraduates is 34. Sierra Nevada College is a small, private liberal arts college, with focused studies at the undergraduate level offered from the departments of business, Fine Arts, humanities and social sciences, science and technology and interdisciplinary studies. Two master’s level programs are available in education and creative writing. The student body is made up of under 600 students, creating a close knit community with an average student to faculty ratio of 11:1. Notable programs include entrepreneurship, teacher education, creative writing and ski business and resort management. Tuition and fees for the 2014-15 academic year total $29,149. The college was recognized by U.S. News & World Report as one of the Best Regional Universities in the West (tier two). 66% of full-time undergraduates receive need-based financial aid, with an average scholarship or grant award totaling $16,130 annually. Wright State is a public research university offering degrees ranging from the associate to doctoral level. The institution is one of the largest in the state and is currently home to over 17,000 students undertaking more than 200 different programs. During the 2014 fiscal year, over $90 million in research and sponsor program awards were disbursed. 30% of students are considered adult, leading the university to offer a variety of learning options, including night and weekend courses and online course platforms. International students make up 10% of the student population, and nearly 20% of students identify themselves as a minority. Princeton Review ranked WSU as one of the "Best in the Midwest"
The university has been named to the President’s Higher Education Community Service Honor Roll with Distinction for four consecutive years. Urbana University is a private university focused on providing liberal arts educations to more than 1,800 students. Over 30 undergraduate and graduate programs are available, with popular studies in criminal justice, entrepreneurial management, sports management and healthcare management. There is a large proportion of student athletes at UU, which currently sits more than 30%. Dual enrollment high school students also make up more than 60% of the student body. The university offers a number of online graduate degree programs for students seeking flexible learning options. U.S. News & World Report ranked UU as one of the Best Regional Universities in the Midwest. Given the small size of UU, student attention is given high priority. The current student to faculty ratio sits at 15:1. Nearly 7,000 students choose to call this public university home, earning their degrees in over 200 different academic areas at levels ranging from associate to doctoral. Programs are offered through the college of arts and science and the schools of applied studies, business law and nursing. Courses are charged per credit hour, offering an affordable education that has been lauded by U.S. News & World Report for graduating students with some of the lowest debt levels in the country. U.S. News & World Report gave WU the 91st slot for Best Regional Universities in the Midwest for 2015. The current student to faculty ratio is 14:1, with 45% of classes having fewer than 20 students. The most popular degrees include business, management, marketing, education, homeland security and firefighting. This urban research university is one of the largest higher education institutions in the state, serving over 13,000 students (including 1,200 graduate students) as of the 2013-14 academic year. Thanks to a large endowment, nearly 75% of full-time undergraduates receive some type of need-based financial aid. The average scholarship or grant award is $5,286 annually. The five most popular majors are criminal justice and safety studies, accounting, biology and biological sciences, general studies and social work. U.S. News & World Report ranked YSU as one of the Best Regional Universities in the Midwest. Specialized student support services include the Center for Student Progress, the writing and mathematics centers, and the Reading and Study Skills Center. The current student to faculty ratio is 17:1. The University of Alaska at Fairbanks is a public research university that serves as the flagship campus for the public university system in the state. Over 10,000 students undertake nearly 200 degrees from nine schools and colleges, including engineering and mines; liberal arts; natural science and mathematics; rural and community development; education; fisheries and ocean sciences; management; and natural resources. Popular degrees for incoming students include general studies, biological sciences, mechanical engineering, business administration, petroleum engineering and psychology. U.S. News & World Reports includes UAF in its list of best National Universities. Over 70 percent of freshmen enroll directly from high school. Wilmington University is a private research institution committed to providing flexible learning options for its students of varied backgrounds. Whether looking for a traditional class, night courses, weekend offerings or a wholly online degree, the institution offers all of these options and more. Over 19,000 students take advantage of 14 locations spread across Maryland, Delaware and New Jersey, making it a popular option for its 70% part-time student body. 52 academic programs are offered, with degrees from the associate to the doctoral level. U.S. News & World Report praised the university’s online offerings, ranking it 48th nationally. The student to faculty ratio is currently 14:1, with a freshman retention rate of 60.5%. Tennessee State has the distinction of being the only public historically black university in Tennessee. Today the university awards over 70 degrees at the bachelor’s, master’s and doctoral levels to students of all races and backgrounds. Courses are offered through the colleges of business, liberal arts, health sciences, agriculture, human and natural sciences, engineering and education. The current enrollment is just under 9,000 students, with over 50% of classes having fewer than 20 students. The average freshman retention rate sits at 62.3%. Notable alumni include Oprah Winfrey and Jesse Russell, the inventor of the microchip for cell phones. There are more than 100 student clubs, organizations and intramural sports teams on campus. Washington Monthly included TSU in its 2014 National Universities rankings. Students looking for a variety of learning options are often drawn to Columbia College, which, in addition to main campus offerings, also has extension courses available at over 30 campuses nationwide, class options at U.S. military bases and an extensive online portfolio. Over 18,000 students take advantage of campus-based programs, while a further 6,000 are enrolled as online students. Degrees available include 10 associate, 62 bachelor’s and five master’s programs. Despite its large size, the student to faculty ratio at the day campus holds steady at 11:1. Princeton Review named CC as one of the best colleges in the Midwest, one of only 153 recognized in the 12-state region. 29 degrees are available fully online, with over 800 courses offered each academic year. Military Times ranked CC in their list of "Best for Vets" in 2015. The University of Montana Western, a public university, is a part of the Montana University System for state institutions. The school is the only public university in the nation to offer Experience One, a program where students take one class at a time, each lasting one month.This type of structure creates a more intentional learning environment for students to be truly immersed in their subject. More than 1,500 students currently attend UMW, with the most popular majors including business and commerce, elementary education, teacher education, secondary education and early childhood education. UMW offers over 40 bachelor’s degrees and eight associate programs. Student attention is a hallmark of the university’s educational philosophy. Student to teacher ratio sits at 17:1, while 65% of classes have fewer than 20 students. The average freshman retention rate, which is seen as an indication of overall student satisfaction, is currently 73%. Montana State University, located in Billings, is a publicly funded institution offering associate, bachelor’s and master’s degrees from its colleges of arts and sciences, business, allied health, education and City College. More than 5,000 students are currently enrolled in both on-campus offerings and 23 degree programs offered fully online. In the most recent academic year, top majors included business and commerce, elementary education, liberal studies, mass communications and psychology. Given the urban setting, 82% of students choose to live off campus in Billings. U.S News & World Reports ranks MSUB among the Best Regional Universities in the West in the second tier category. 87% of students who graduate from the university choose to stay in Montana for work or further education. Over 50% of classes have fewer than 20 students; the average student to faculty ratio is 18:1. Pursuing your education at an open admissions institution offers many benefits. Your open admissions program comes without costly application fees or test scores and does not cause the stress that comes with competitive applications. Open admissions schools work with part- and full-time professionals and students with families to ensure they get a quality education that balances personal and professional commitments. Additionally, open admissions schools recognize that not all students come from the same background. For students with lower grades, open admissions coursework provides a framework to demonstrate your ability to work at the college level. If you feel unprepared for the hectic process of college applications or the immersive experience of a four-year institution, open admission colleges online may offer the right support system for you. By creating a strong track record at an open admissions school, you will demonstrate your commitment to higher education. Furthermore, all completed coursework may transfer into a four-year program, should you wish to continue your education. One common misconception about open admissions programs is that they have less to offer a student than a traditional four-year program. While it is true that fewer open admissions schools offer a standard four-year degree, that does not devalue the coursework they provide. Two-year open admissions programs strive to meet state and regional standards of education, whether the program has a liberal arts focus or a technical orientation. The increased accessibility of open admission colleges online means students can access preparatory and specialized courses nationwide, making access to education easier. While the four-year campus experience is still considered a "traditional" education, the benefits of online coursework in terms of flexibility and accessibility are increasingly outweighing the old model. By sidestepping competitive student admissions, your academic progress is not limited by your past experiences and personal resources but rather is built upon your current dedication and performance in higher education. The best open admission colleges provide a venue to complete two-year degree programs and certifications, and become a stepping stone to further education, in a four-year program either at the same institution or by transferring to another school.